BB: What was your career before becoming a Bella Bridesmaid owner, and what attracted you to the franchise? MK: I worked as a Business Analyst for the Facility Management Department at the Chevron Refinery in Pascagoula, Mississippi. 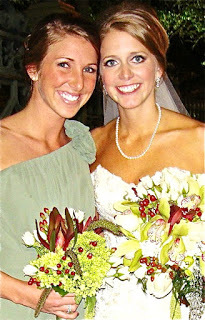 In February 2011, my great friend, Ashton, asked me to be a bridesmaid in her November wedding. We immediately started looking for dresses at some of the local bridal shops, but never found anything that we loved. Ashton called me one afternoon, while she was on a trip in Nashville, to tell me she found dresses at 'this awesome boutique called Bella Bridesmaid' and how the Mobile area terribly needed one of 'these places'. I nonchalantly laughed and agreed, but after visiting the Baton Rouge store, for my fitting appointment, I knew for sure this was something I would love to do and that the Mobile area did, indeed, need one. That night I went home and contacted Bella Bridesmaid, to request some franchise information, and now here I am, the owner of Bella Bridesmaid Mobile! BB: What is the most memorable moment so far in owning your boutique? MK: Gosh…it's a toss up between two great ones. I was absolutely on cloud nine during my trip to the October Bridal Market in New York City, where I got to meet and hang out with the other Bella Bridesmaid owners, as well as with several famous dress designers. It was fantastic. My other memorable moment was on the very night before I opened my doors for business; I completed the finishing touches (tagging dresses, printing information sheets, etc) and did a full cleaning...the lighting, the smell, everything was just perfect. As I was walking out to lock up for the night, I looked around and it hit me, then, that I had accomplished a huge goal and that this really awesome store belonged to ME. It was kind of surreal. I took a picture so I could remember that forever. BB: What is your idea of a perfect night out on the town? Which one of our dresses would you wear, and how would you style it? MK: Living on the gulf coast, I love going for dinner and drinks anywhere outside by the water…usually with a live band…and of course, with someone special. 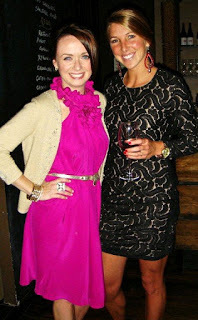 :) I would wear Joanna August's long State Street dress in black and I'd add a long gold necklace to go with! BB: Fave celebrity wedding dresses? MK: Loved Kate Middleton's gown! It looks so similar to the one my mom wore, which I actually have hanging on display in my store! BB: How would you describe your own personal style? MK: I'd say my style is pretty classic. Right now, I'm really digging maxi dresses. I love something simple that I can wear with a pair of big bright earrings. MK: Ahhh, Belize! Myself, and three of my dear friends camped in tents on a little island for 7 nights. It was such a fun adventure--we snorkeled, fished, and napped in hammocks. 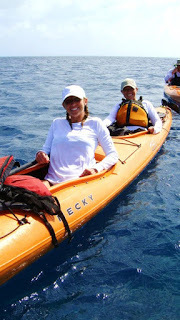 My favorite, though, was the day we kayaked to the Great Blue Hole and swam in the very middle of it! SO unbelievable. BB: Favorite movie that you can watch over and over? MK: The Holiday, with Cameron Diaz and Jude Law. Absolutely love it. MK: Left arm- big gold watch, several different sized gold bangles, and a couple with a splash of color. Right hand- stacked gold rings! MK: "Crush" is probably a stretch, but "celeb" no doubt… There's this Kim chick- winner of Survivor: One World. My family and I pulled for her from the beginning…She's pretty legit, y'all. BB: Favorite quote or expression? American Idol or The Voice? - The Voice! Two words...Blake Shelton. Prince William or Prince Harry?